Closing day already and the Under 60’s beat the Over 60’s to win the ‘Jim McLean’ trophy. I put it down to genetics. Sorry ‘GERIATRICS’! Final footnote goes to Ross Warrender who won the ‘Singles League’ with a victory over David Campbell. Well done to everyone who took part throughout the season. Congratulations to Eddie Waltham on winning the ‘Two Bowl Singles’ against Andy Weir in a game played under difficult conditions due to the heavy rain and flooding of the greens. Congratulations also to our friends from Rothesay on winning the ‘Pat Cargill Trophy’ and helping to raise a sizeable amount for ‘Macmillan Cancer Support’. Two more finals played today and the ‘Under 30’s’ was won by Ryan Gualtieri who beat Ryan King and the ‘Mixed Pairs’ was won by Margaret Kelly and Iain Cook against Jo and Willie Hayden. Congratulations to the winners and commiserations to the runners up. The ‘Two Bowl Pairs’ was played in semi twilight this evening and went to an extra end. Congratulations go to the winners Alistair Davidson and Stuart Allen along with commiserations to the runners up Grant Middleton and Derek Grieve. Belated congratulations to Kenny Shannon who was announced as Bobby Smith’s VP Elect today. Best wishes to Bobby and Kenny for a happy and successful tenure. Congratulations to the winners of this year’s ‘Balloted Pairs’, George Lorimer and Eddie Waltham and commiserations to the runners up, John Lonie and Alan McKechnie. Apologies for lack of pictures – slipped up!. Congratulations to all the winners, particularly Grant Middleton who has now won the Championship for the seventh time and surpasses his previous record. Commiserations to all the runners up and well done to everyone who helped out in getting the greens playable after the heavy rainfall. Thanks also to all the other hard working people in the background, bar staff, catering etc. Earlier results can be found on the relevant ‘Prizewinners’ pages. Pictures are available in the ‘Media Gallery’. Apologies for the delay with these results which was due to a web server problem outwith my control. A bit of a dreich evening for the ‘Ladies Triples Final’ and congratulations go to the winning team of Anne Miller ( Sub for Margaret Kelly ), Ellen McGregor and Yvonne Grieve. Commiserations to the runners up Linda Walls, Lilias Campbell and Jan Lindsay. 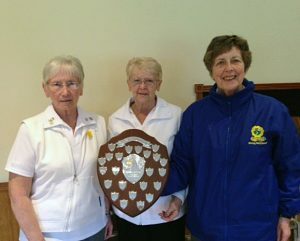 Congratulations to Nan Davies and Lorna Reedie who won the ‘Ladies President’s’ and ‘Vice-President’s’ trophy respectively today and commiserations to the runners up Violet Stewart and Linda Walls. The ‘Willie Milne’ rinks tournament today and the winners were Billy Whyte, Willie Hayden, Len Davies and Jim Craig. Commiserations go to the runners up, Andy Scobie, John Brophy, Jim Whyte and Robert Smith. Congratulations to the winners of the ‘Little’s Sponsored Tournament’ today who were Anne Mc Kechnie, Maria Crilly, Michael Devine and Jim Craig. Commiserations to the runners up, Jan Lindsay, Allan Lavetty, Bob Rooney and John Brady. Many thanks to ‘Little’s Funeral Services’ for their continued sponsorship of this competition. Monday the 24th July saw a gloriously sunny day mark the beginning of the ‘Bowls Scotland National Championships at Northfield. 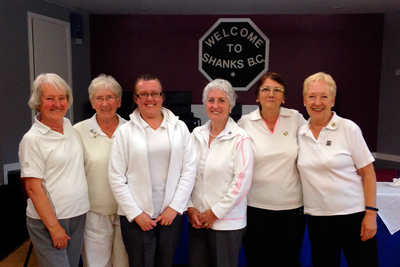 We had representatives in the Ladies and Gents senior singles, the Junior singles and Ladies Senior fours. Unfortunately Nan Davies went out to Prestonpans Castlepark in the Ladies singles and Ryan Gualtieri went out to Kircolm in the Junior singles. However, Jim Craig won his first round Senior singles against Holytown and went back on Tuesday 25th but lost out to Bankfoot. 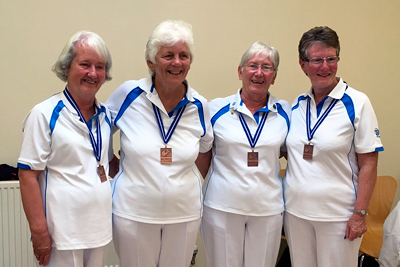 The Ladies senior fours had a marvellous 3 days with wins against Dumfries, Newmains and Galston which got them into the semi-finals against Whitburn. Wednesday morning saw the weather take quite a turn for the worse and Whitburn ended their run which sadly meant they didn’t quite make the final. Congratulations to the ladies on their bronze medals and on a terrific achievement by all the players in getting to Northfield and representing the Club so well. CLICK HERE for some more pictures from Day 1 with apologies for missing out on Ryan. Sorry for the quality on some of the pictures. Congratulations to the winners of this year’s Fellowship Triples’ who were John Thomson, Josh Jeffrey and Donnie McQuarrie. 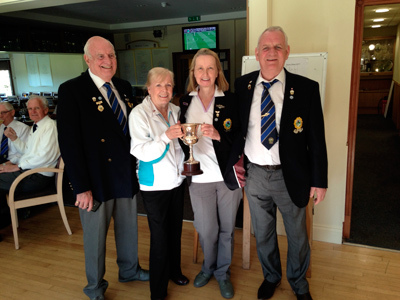 ‘Mixed Triples Day’ today and after a fairly showery day congratulations go to the winning team of Joe Gaffney, Margaret McPhillips and Harry Fenion. and well done to everyone who took part. 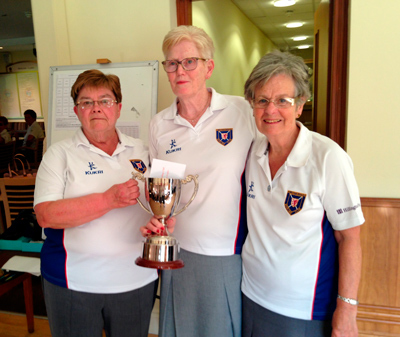 Well done to our Singles (Gladys Brittain), 2 Bowl Pairs (Dorothy Collins and Jo Hayden) and Triples (Margaret Kelly, Ellen McGregor and Yvonne Grieve) on winning today in the District Finals of the West of Scotland WBA. Well done also to our successful Seniors who won their Bowls Scotland District Finals and are heading to Northfield for their next games. Singles, Nan Davies, and Fours, Margaret Kelly, Liz Farquhar, Ellen McGregor and Dorothy Young. Commiserations to the runners up John Hart, Alan McKechnie and David Elliot. The Helen Robinson Ladies Invitation Triples was played today by fourteen visiting teams and six Cardonald teams in non-stop sunshine. Two teams won all six of their games so it went to shot difference. The runners up were Jean Williamson, Mary McGroarty and Moira Jamison from Hawkhead. The winners were Sandra Kerr, Helen Parrott and Norma Hood from Hillington. Thanks to Anne Miller for report and picture. The Mixed Jubilee Game was played today in glorious sunshine. It was a tight finish with three teams scoring the same points so it was decided on shot difference. Runners-up were Christine Woolley, Anne Bremner, Robert Armstrong and John Brady. Winners were Anne Miller, Jane O’Brien, Andy Anderson and Ian Stewart. 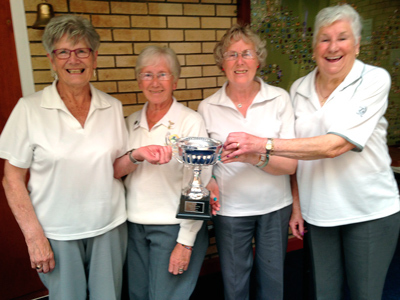 The ladies played their first competition of the Season today – the Balloted Triples. After a great Final the runners- up were Margaret Kelly, Gladys Brittain and Dorothy Collins. Well done to the winners who were Jan Lindsay, Morag McLintock and Ellen McGregor.